I have to admit that when working on something as intently as getting the Iran Divestment bill passed in the South Dakota Legislature, it is difficult not to feel pride. I am grateful that our efforts were successful. 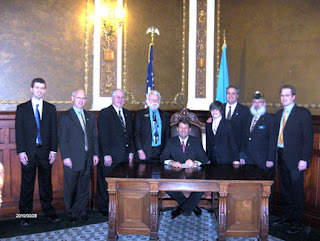 So many people were involved in the bill’s passage, that I can only take a very small bit of the credit. Should I feel great for the success or should I feel great because of what this bill represents? Doing what we can to assist our troops is what is most important. This was the issue when we started and is still the issue. At home we do not put our lives on the line day in and day out. Stopping the funding to the terrorists is the least that we can do. Congratulations to the South Dakota Legislature for passing this bill, the governor for signing it and to all of those who lent their voice supporting this effort. 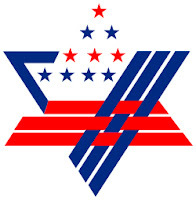 I just returned from the American Israel Public Affairs (AIPAC) Policy Conference in Washington, DC. Like many AIPAC conferences, most of the attention focused on the issues of the day. Today the issues are crippling sanctions against Iran to entice it to stop its efforts to attain a nuclear weapons capability; recommitment to a strong US – Israel Alliance; and passing the foreign aid bill with its 3 billion dollars in aid to Israel. These issues are the same as in the past many years with some different nuances. We have many friends in both houses of Congress on both sides of the aisle but the support of local constituents lobbying on these issues has a great impact. Most of the speeches over the 3 day conference focused on these important topics or on the miracle of Israel. The most important speech to me was delivered by Howard Kohr, Executive Director of AIPAC. While covering the importance of these issues and our need to lobby on them, he began a discussion on being pro-active for Israel. Here is the link to both the video and the transcript of his speech. About half-way through the speech, you will find this paragraph which segues into the pro-active ideas. We need a public relations campaign. We can no longer allow our detractors the open field. We must challenge their lies and half-truths with the light of truth. We must not allow ourselves the reflexive response of self-doubt. If our opponents’ arguments have a small element of truth, we must not allow that to be a wedge to stop us from providing the entire story. Howard does not talk specifically about the story of the Muhammad Dura but I believe it to be they type of journalism we want to prevent. A French television network filmed a video in which they show this young boy being killed in a cross-fire exchange between Israel and the Palestinians. The film leads you to believe that the Israelis murdered him. Shortly after this video came out, the world was outraged at Israel. In response the Israelis showed that it was impossible due to the angle of where Muhammad was to have been hit by Israeli bullets. 5 years later after a lawsuit in France forced the French television network release the entire video footage we get to see what really happened. Not only was Muhammad Dura not killed by Israeli cross-fire, he was not killed at all. At the end of the video he just gets up and walks away. Where is the outrage to being lied to? To be pro-active, we must remind the world that our detractors have lied before. When we hear the next outrage, will we demand conclusive evidence before we believe the event or not? Howard you are absolutely correct. We be pro-active. We need to tell Israel’s story for the entire world to marvel at. We must demand the truth from our detractors and have them explain any fallacies from the past. Other groups have talked about being pro-active for Israel, but I believe that AIPAC will get the job done. Does the Obama Administration wake up every morning and think that the world was just created again? Do they think that they can organize the world as they believe it ought to be? We could discuss this on just about every important issue facing the United States today, but I want to focus on the issue that I have been following for most of my adult life. The issue today is Israel and the Palestinians. Last week, Israel announced that it would allow construction of 1600 housing units in the eastern part of Jerusalem in a Jewish neighborhood while Vice President Joe Biden was visiting the country. Current United States policy is against any construction in territory that Israel conquered in the Six Day War in 1967. This announcement embarrassed the Vice President. Israel’s Prime Minister, Benjamin Netanyahu, immediately apologized for the announcement coming as it did and embarrassing the Vice President. The Vice President formally accepted the Prime Minister’s apology. Obviously, the Vice President forgot to check in with the President and the Secretary of State before accepting the apology. Upon his return home, Ms. Clinton after meeting with the President, called Prime Minister Netanyahu and dressed him down for the announcement. She said that he was insincere in attempting to hold negotiations with the Palestinians. She demanded that he cancel the construction project and wanted to know what other concessions he would give to the Palestinians to get them to the negotiating table. Did they just wake up to a new day? Is history unimportant? Since his election as Prime Minister, Mr. Netanyahu has been calling for negotiations with the Palestinians. The Palestinian Authority has used many excuses not to come to the table. Why has this administration not held their feet to the fire to negotiate? Now I know that this is probably way too long ago for this administration to remember but in 2000 then Prime Minister Ehud Barak offered the Palestinians a peace deal that was considered overly generous. Even President Clinton condemned Palestinian Chairman Arafat from walking away from the proposal. Chairman Arafat did not make a counter proposal. He just walked away. I guess that is too long ago for the Secretary of State to remember. Israel has formally made offers even before 2000 to solve this conflict but has never had a willing partner. What have the Palestinians done? How far back does one need to go? Just this week in Ramallah, the current seat of the Palestinian Authority, they renamed a square in honor of a terrorist who was directly responsible in the cold blooded murder of 38 Israelis including 13 children. I do not recall seeing a condemnation of the Palestinians. I could talk about how they call for the destruction of Israel in their mosques and call Jews pigs and monkeys who deserve to be destroyed. I could talk about the celebrations in the past when suicide bombers murdered innocent Israelis in their terror attacks. Remembering these events is just unimportant, I guess. History does not matter. Well it is a new day. If those damn Israelis would just give up a piece here and there. We are not asking for anything really important. They can always count on the United States to come to their aid. We always do what we say. Our word is golden. Who does Israel think it is by not doing these little things for us? Well tomorrow is another day. Maybe the Administration will see this issue in a new light. Maybe we will remember who our friends are. Or maybe some other issue will be important. While I was walking in Vienna, I told Deborah that in many respects my trip was surreal. Consider that I had left Sioux Falls a few days before. Sioux Falls is a city that is not quite 150 years old. We were walking in Vienna that was established by the Romans as a fortress on the edge of the eastern Alps not quite 2000 years ago. Shortly I was going to Israel. I would be in Jerusalem that we know was King David’s Capitol 3000 years ago and is at least 4000 years old as the bible tells us Abraham was there. I would be driving by Jericho (in the Palestinian Authority area so I was not going to enter), probably the oldest city in the world at nearly 10,000 years old. To think how much history has unfolded at these various places and the span of their lifetimes for a simple man from South Dakota is just mind boggling and surreal. How quickly time flies! I returned to Sioux Falls last Monday, just a week ago, and it seems like forever that I was in Vienna and Israel. How I long to be again soaking in the waters of the Dead Sea but I will leave that blog for another time. If you read my previous post, you already know a bit about our relationship. As Dimona and the Network are a Perfect Match, the crown jewel for me, personally, is the relationship developing between Eugene Field School in Sioux Falls and Ami-asaaf School in Dimona. These schools are both Art Magnet (art immersion) schools for their respective communities. Twinning gives these children a chance to learn about a different culture and environment. But kids are kids and art is art no matter where in the world one is. The story begins last year when Carol and I were vacationing in Israel. Before we left, we had contacted our Network representatives about going to Dimona and seeing what our partnership was doing. We saw several sites but were struck by the reception at Ami-asaaf School. Carol dutifully posted our pictures on Facebook. A local friend of ours, Sara Crosby, saw the post. They had a chance to get together in Sioux Falls and Sara told Carol that we have a similar school here. Being our children have been out of the school system for about 15 years, we had no idea. Sara contacted the school and organized a meeting. Our ideas were received with great enthusiasm. The administration, staff and parents thought that this was a great idea. Many thanks go to Sara. I contacted Ami-asaaf. Not being in Israel, I do not know what they individually thought but the return email was is a great idea. Summer came and the school year started and the two schools were still trying to get all of the connections made. Emails are being exchanged and the excitement is building. Before I left for my Big trip, I picked up at Eugene Field School letters and artwork from the students to take to Dimona. The box took up a large portion of my suitcase. I was thrilled. Upon arrival in Dimona, my very first stop was Ami-asaaf School. The teachers, staff and children are so wonderful. I again met Kochava Asraf, the principal and then Rachel Rachamim, English teacher and our liaison. You would have thought that I was a dignitary. I was greeted by a choir who serenaded me. I recorded a portion of their singing and have uploaded it to You Tube. I was next escorted to the English classroom where a saxophone ensemble played for me. I have also uploaded a portion of their performance to You Tube. Following this, I presented the children with my package from Eugene Field School. I wish I could describe the excitement. Like I said, kids are kids everywhere. To add to their excitement, I showed them pictures of all of the snow we have in Sioux Falls. They loved it. Before we were done, Rachel presented me with letters and art to bring back to Sioux Falls. I brought home as much, if not more, than I had taken. I did not know if I would be able to fit it in my suitcase, but I did not care. I was and am just so happy that this relationship is working and both schools are committed to making it grow. When I returned home, I quickly made contact with Ann Henkhaus at Eugene Field School. I delivered her the package with all of the letters and art. She distributed this to the kids in the school. 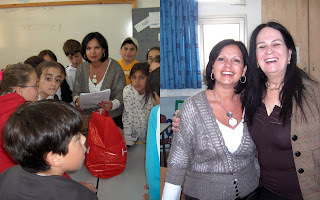 In visiting, she asked me to come to school and meet with the children to discuss my trip. As I hope you can see, I am so very excited about all of the connections between Dimona and the Network. For me this local connection is the greatest but all of the ties are wonderful. 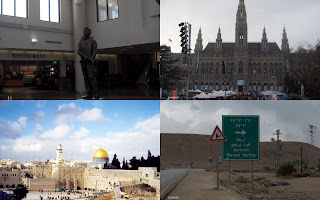 I just returned from a wonderful trip that took me to Vienna, Austria and several places in Israel. The main purpose of my trip in Israel was to go to Dimona, a small city of about 40,000 in the middle of the Negev Desert. I came as a representative, officially the American Steering Chair of the Jewish Federations of North America (JFNA), to meet my Israeli counterpart, Professor Haim Kalman, see projects in which we are invested, and hear proposals for possible new projects. Now that I have explained why I was in Dimona, I want to discuss this partnership and what makes it perfect. The Network is a confederation (my description) of approximately 350 small Jewish communities around North America with only lay leadership. We raise funds for distressed Jews in Israel and the Diaspora. Our contributions originally went to the United Jewish Appeal, then toits successor the United Jewish Communities and today to the Jewish Federations of North America. Not quite 20 years ago, a separate division was created, the Network. As I view it and I am sure if someone from JFNA reads this they will disagree, the Network is kind of the Ugly Duckling of the organization. As one would expect, JFNA, is run by the large federations. Many times I have met Jews from large Jewish communities and when I tell them I am from South Dakota they ask are there really Jews there? In the Network, we raise significant dollars but not by a New York, Los Angeles or other large Jewish community standard. Understandably, they cannot overlook our contributions, but likewise, being so small and spread out, what services can JFNA provide? Dimona is a town established in the 1950s. As with other communities in the Negev, this town was the fulfillment of Israel’s first Prime Minister, David Ben-Gurion’s dream to populate the Negev. Israel, following her independence in 1948, absorbed hundreds of thousands of displaced Jews from Europe and the Arab world. While Ben-Gurion’s dream was great, the reality was that the government did not have the resources to fully take care of these immigrants. Over the last 12 years, I have been to Dimona 4 times and usually I get asked by Israelis why would I want to go there? Like the Network, Dimona is an Ugly Duckling of Israel. In 1996, our parent organization and the Jewish Agency for Israel established partnerships between various Jewish communities outside of Israel with communities inside Israel. Dimona and the Network, the two Ugly Ducklings got each other. One could easily say that each got dumped on by its national organization. I disagree, we are a perfect match. We understand what a fight we have just to be recognized. Our adversity creates opportunities to find ways to work together for the betterment of both. While many of the larger North American communities may see their partnerships as just a philanthropic endeavor, ours can be a true partnership. The Network can help fund programs for the less fortunate in Dimona and Dimona can be the Network’s strong bond with Israel. As always, the devil is in the details. Together, we can face our challenges and our needs. Together, we can meet adversity and overcome it. Together, we can win for everyone. These two Ugly Ducklings were made for each other – a perfect match. And like the Ugly Duckling in the children’s story, we will grow into beautiful Swans.